“Hamp jumped that route like he knew what was comin’! hollered a Trenton support staffer. Hamp Cheevers’ “Pick 6” in Trenton’s 48-13 win against Port St. Joe displayed why 15 colleges have extended scholarship offers to the 5-foot-11, 165-pound senior cornerback. Cheevers and the Class 1A No. 1 Tigers (5-0 overall, 2-0 in in 1A-7 play) travel to district foe Bronson (0-5, 0-2) on Friday. A major showdown is lurking with rival Newberry (5-1. 3-0) next week that could likely decided the fate of District 1A-7 for the district’s two playoff berths. Like a cheetah — although the Tigers’ defense prefers the name “Land Sharks” — approaching its prey, Cheevers crept forward after the ball was snapped. His first few steps were slow. Had he pounced on the route too quickly, Cheevers risked the PSJ quarterback noticing and holding onto the ball. Cheevers timed each step perfectly before exploding in a blur to catch the ball in stride — like the pass was intended for him. No one was going to catch Cheevers (dude runs a 4.4 second, 40-yard dash) and he raced 30 yards untouched into the endzone. “I’m always watching everything,” Cheevers said. “I kind of picked up on (the play) when they ran that bubble on the other side of me. I saw they had success and picked up like nine yards and then the quarterback comes over and tells the (receiver) something. I don’t know what, but (the QB) told him something and (the receiver) shook his head, so I was like, ‘Oh, yeah, they’re fixin’ to try that again to see if they can break it over here,’ so I knew I had to be ready. As a defensive back, Cheevers doesn’t get many opportunities (he gets tons as a running back/receiver/returner for a team that averages 50.5 points per game) because opponents rarely throw his direction. “He gets bored and really doesn’t get to press (man pass coverage) a whole lot because he likes to try to bait people (into throwing his way),” said Trenton coach Andrew Thomas. “He was in kind of a Cover-2 concept on that pick off. I guess (PSJ) thought he was going to drop to cover (the receiver) over the top, but he just read it. Instincts paid off for Cheevers again this past week with a pair of touchdown returns, including a 44-yard interception and a 75-yard kickoff, during a 54-10 shellacking at district rival Dixie County. A “yes-sir, no-sir” type of young man who sports a 3.1 GPA and scored a 21 on the ACT, it’s no wonder Cheevers has attracted multiple scholarship offers, but only three from FBS-level programs — Buffalo, Idaho and Marshall. Florida Atlantic may be close to pulling the trigger on an offer and several others are actively recruiting Cheevers. Whether it’s FBS or FCS, Cheevers doesn’t care as long as his school of choice meets a certain criteria. Cheevers’ scholarship tally should grow as more highlights make the rounds to college coaches that recognize and reward football savvy. For a player like Cheevers who rarely comes off the field, he also understands the importance of staying punched in for every snap when it comes to recruiting. Even if coaches aren’t in attendance, most will watch video of entire games before offering a scholarship. Like Cheevers, they’re always watching everything. Recruiters evaluating Cheevers also will notice several more college prospects on Trenton’s team, especially on its “Land Sharks” defense. With a first-team defense that has yet to yield a touchdown, Thomas doesn’t mind. Senior defensive tackle Josh Smith (6-0, 270) reports a scholarship offer from Idaho and multiple FCS programs. “If he’s 6-2, I think he has a lot more interested because he’s got a lot of ability,” Thomas said. Tennessee State has offered senior cornerback/receiver Brooks Martin (5-11, 170) and is taking a long look at senior linebacker Kade Rogers (6-1, 210), who Thomas called his most physical and dominant player. Thomas said senior linebacker Tre McCleese (6-1, 215) could be a “steal for a smaller college,” according to Thomas. Junior defensive tackle Josh Mathis (6-3, 280) is attracting attention because of his size, quickness and steadily improving technique. 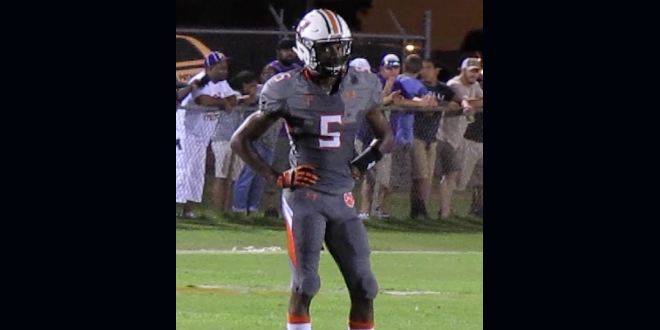 Another “Land Shark” underclassman to watch is head-hunting sophomore safety Randy Fuller Jr. (6-0, 175), who plays with the same level of football savvy as Cheevers. That trust kept Cheevers loyal to his teammates when he was tempted to move to a bigger program. He wouldn’t have been “overlooked” like his teammates and playing on a larger stage likely would have led to more scholarship offers. However, Cheevers got a taste of winning a state championship as a sophomore and plans to pack for a return trip to Orlando. “I couldn’t leave Trenton,” Cheever said. “This is my heart pretty much. Born and raised here playing football with these guys. I couldn’t leave them hanging. I didn’t want to be selfish.